Hammond Model JR-20 | MOSweb Online! 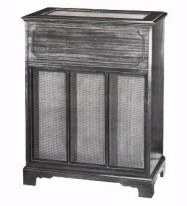 The JR-20 tone cabinet is ideal for homes, small church, mortuary, and entertainment places. ITs responce is non-directional with the highs projected vertically and the lows horizontally. The amplifier is constructed with separate sections for bass and treble response with a crossover point at 200 cycles. A reverberation preamplifier is also incorporated in the amplifier chassis and reverberation is obtained in three degrees on each channel, independent of each other. The reverberation signal cannot be transferred to other tone cabinets.